Time: 7:00 a.m. Sunday, up a little later than usual, but not feeling overly guilty about it. Place: Back at my main computer, which had been out of commission. It wasn’t starting up, so I took it into the local shop and paid $49 to find out that there was absolutely nothing wrong with it. And sure enough, it’s working fine now. I have no explanation, nor did the repairer. Reading: My current major reading project is Umberto Eco’s The Book of Legendary Lands, which is quite a lovely experience so far. I am also gradually working my way through The Mindful Way Workbook, which is providing some helpful hints. And having recently discovered Gabrielle Bell, the wonderful graphic novelist, or comic diarist as she is sometimes called, I’ve started on her book The Voyeurs. Viewing: Twice a year, Barnes and Noble has a 50% off sale on the Criterion Collection, which is sort of a boon for film fans, except that they, which is to say I, purchase more films than absolutely necessary. This has allowed me to see, finally, Abbas Kiarostami’s Like Someone in Love, a haunting and vaguely disorienting film about the relationships, romantic and otherwise, in a young Japanese woman’s life. It’s very different from Kiarostami’s last film, the much acclaimed Certified Copy, but leaves the viewer unsettled in much the same way. (By the way, Kiarostami’s totally gorgeous 1999 film The Wind Will Carry Us is about to come out on Blu-ray, and I will be all over that.) Several other Criterions I bought, including Breaking the Waves, Master of the House, and Picnic at Hanging Rock, await. Also viewed this week was Jacques Rivette’s Le Pont du Nord, which was about as enigmatic as the Kiarostami film. I also had the opportunity to attend a performance by Jean-Michel Richaud of Leonard Nimoy’s one-man play Vincent this past Thursday at the Nevada Museum of Art. Years ago I saw Mr. Nimoy himself perform the play, in which Theo van Gogh talks about his recently deceased brother, on television, and it was great seeing it again. Listening: Not so much music listening the last couple of weeks, for reasons addressed below. Blogging: I finally put a mind to completing the writing I have long wanted to do on the subject of Chinese calligraphy, having been inspired months ago by the exhibition Out of Character: Decoding Chinese Calligraphy at the Asian Art Museum in San Francisco (and now at the Metropolitan Museum of Art). Many pages of notes, and a general sense of inadequacy, left me overwhelmed for a long time. Finally I arrived at a form for all the stuff – two posts, an introductory blog post on the wider subject of calligraphy in China, followed by a review of the exhibition catalog. The latter, by the way, was the 200th post I’ve made to my blog! This whole project was a lot of work. But the result is fairly acceptable, and now it’s done! Pondering: (1) The vagaries of my mood. As I’ve described here in recent weeks, I’ve been having some slight depression problems. But a week or two ago these suddenly vanished, like mist dispersing and evaporating as the sun rises. Now everything is more or less fine. Why this happened is as mysterious as why the darkness descended in the first place. But I’m not complaining about the result! (2) As part of my increased exercise regimen, I have been working my way through the Couch-to-5K running program. Earlier this week I started Week 4, which features a considerable increase in activity from Week 3, and I wasn’t able to complete the first day. Yesterday was Week 4 Day 2, and at first I thought I was going to have to abandon the last five minutes of running and fail again. But I willed myself on, and as I did I had a strange experience, very like the one described in mindfulness meditation. While meditating, instead of dwelling on thoughts and feelings, you’re asked to observe them, stepping slightly outside of one’s self as it were. As I ran, rather than feeling exhausted, I was somehow able to observe myself being exhausted instead, at a remove, and I completed the run without too much difficulty. This is an experience I need to remember, and call upon when other difficult circumstances arise. Anticipating: The end of my wisdom tooth extraction-related pain. The infection and swelling on the left side of my mouth still hasn’t quite gone away, making chewing actual food difficult. In generosity and helping others be like the river. In compassion and grace be like the sun. In concealing others’ faults be like the night. In anger and fury be like the dead. In modesty and humility be like the soil. In tolerance be like the ocean. Either you appear as you are or be as you appear. 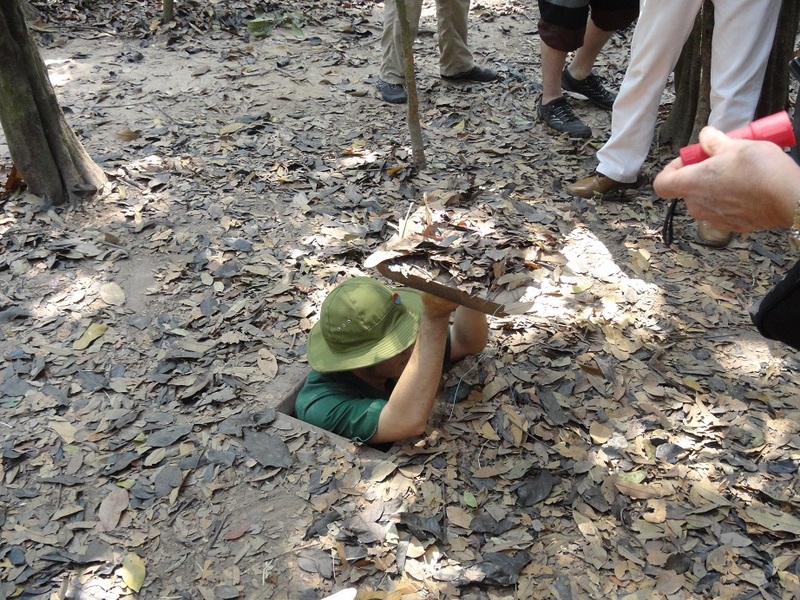 After breakfast, we got on the bus for a two-hour drive to the Cu Chi Tunnels, part of the vast network of tunnels, spanning over 120 miles, in which Vietcong soldiers and ordinary folks hid and lived during the Vietnam War (or, as they call it here, the “American War”). 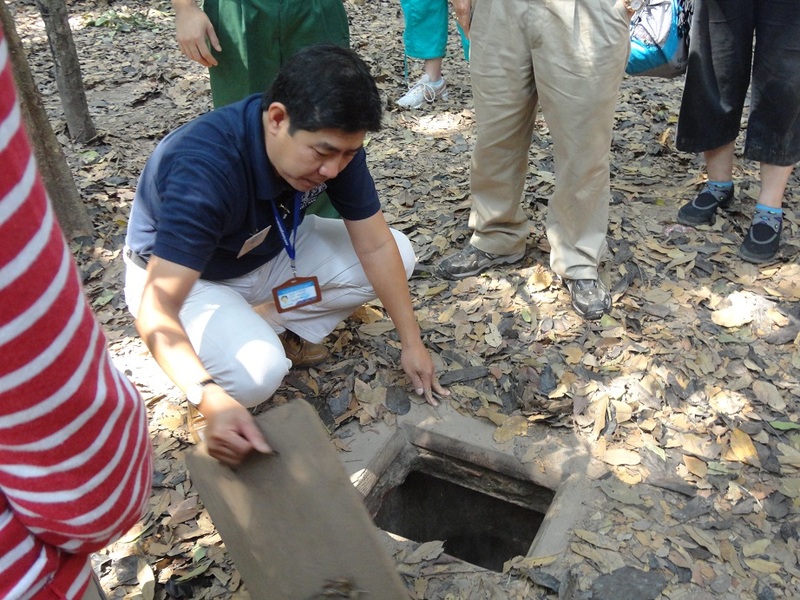 Our guide D told of some of his own experiences – his father’s disappearance for four years and re-education, and D’s own time as part of a bomb-clearing team. Pretty harrowing. He also gave us a lot of background on the tunnels and how they were constructed. They were built on three levels, and included dedicated kitchens, mess halls, meeting rooms, ammunition storerooms, and bathrooms (removed from the other rooms by an L-shaped hallway, and cleaned every day). Ventilation was said to be decent, and the tunnel entrances were protected by booby traps. Crawling through one of the tunnels, one that had been specially widened for visitors, it is almost unfathomable how they made this all work. Time: 10:30 Sunday morning, a little later than I usually work on my Salon. I slept in, so sue me! Place: At my main computer, still surrounded by remnants of old computers I want to get rid of. Consuming: Just finished a nice bowl of cereal. Now it’s back to coffee. Reading: I have just about finished Roger Lipsey’s excellent The Spiritual in Twentieth-Century Art. I’m sure I’ll be doing a review for the blog pretty soon. After I’m done with that, I will be turning to reading related to my upcoming trip to southeast Asia (less than two months away now!) My next books will be Michael Coe’s Angkor and the Khmer Civilization and Buddhism: A History by Noble Ross Reat. As a little end-of-day reading I’m continuing to enjoy Why We Write: 20 Acclaimed Authors on How and Why They Do What They Do. Watching: The only film I watched this week was one that I’d already seen several times. But it happened to appear on Turner Classic Movies (the one television channel I think I could not live without), and I couldn’t resist watching again: the outstanding Sullivan’s Travels (1941), written and directed by Preston Sturges, and starring Joel McCrea and Veronica Lake. Seldom has there been such a neatly crafted film, that turns from comedy to drama and back again so effortlessly that you hardly even notice. Once again related to my trip, I am also watching, and reading the accompanying book, Foundations of Eastern Civilization from The Great Courses. Listening: I’m still plugging away at writing program notes for January’s concert by the Reno Philharmonic, and so have been listening to things like the Ancient Airs and Dances Suite No. 2 by Respighi and the Fourth Symphony by Brahms. One other CD that I must call attention to because it is so good is the most recent effort by the chamber ensemble eighth blackbird, meanwhile – a great selection of very vivid and colorful music. Pondering: Last week I was pondering how much I needed to start making lists of tasks in order to be more productive. This week, after a couple of very productive days, I’m pondering how good of an idea that was. Also, I read today of the death of Peter O’Toole, one of the greatest actors of our time, and I was remembering back to when I saw him on stage in London, around thirty years ago now, in Shaw’s Pygmalion. He was almost certainly drunk, and even came close to falling over a couple of times. But he was also fabulously funny and energetic. How much fun that evening was, and how much charisma O’Toole had… If I had the time to spare, I’d watch Lawrence of Arabia or My Favorite Year again today. Blogging: Not much recently, but several things are in the works. Anticipating: Getting into the holiday spirit, because it certainly hasn’t happened yet! Gratuitous Video of the Week: A few days ago, in an online forum I take part in occasionally, the subject of Vivaldi came up. And I chimed in with what is probably my favorite Vivaldi work, the Concerto in C major, RV 558 “con molti stromenti.” I posted a link to a YouTube video of a nice complete performance of the Concerto. But, honestly, much more to my taste is this performance of the Concerto’s first movement by Fabio Biondi and Europa Galante. Vivaldi came up with a truly peculiar ensemble for this work – pairs of mandolins, theorbos (relative of the lute), recorders, trumpets, chalumeaux (a single reed woodwind not unlike a clarinet), and violins in tromba marina (take note of the aluminum foil the two lead violins have on their instruments, adding a little “buzz” to their sound to imitate the sound of this obsolete string instrument), along with cello, strings and continuo. These diverse, extravagant colors are used by Vivaldi in a really marvelous way. Biondi is known for his fairly extreme interpretations of Baroque era music. But in this case, his approach to color, dynamics and tempo – his basic tempo for this movement is faster than any other I’ve come across, and he slows down and speeds up in fairly unusual ways – really suits this zany, tuneful, wonderful music. It’s a whole lot of fun. Enjoy! It’s time for the weekly visit to the Sunday Salon, to review the week past and to look forward to what might be ahead. This week I started a pretty simple new regimen that has already paid off to some extent, and may provide greater rewards in the future. I now get up earlier in the morning, almost immediately go for a 30-40 minute walk, and then sit down and do the “morning pages” as suggested in Julia Cameron’s book The Artist’s Way. Aside from some minor soreness, the walks have been welcome. While I still don’t quite get the point of the morning pages, I have often read that their point isn’t clear at first. So I will persevere, and see what happens. For a change, this has been a reasonably productive week on the blog, with yesterday’s item on issues from the world of Japanese kabuki, some lovely photographs of Charlie Chaplin and Helen Keller, and a few other odds and ends. Traffic at the blog had a little blip this week when the Haruki Murakami Stuff Tumblr, which I really enjoy and highly recommend to anyone interested in Haruki Murakami’s work (lots of interesting art, photos, quotations, and links to be found there), linked to my article about Murakami’s non-fiction book Underground, about the 1995 gas attack on the Tokyo subway by the Aum Shinrikyu religious cult. One other little life change I’m easing into is to watch fewer movies, and try to emphasize quality rather than quantity. Not that I haven’t tried to steer toward worthwhile films in the past, mind you. But now I’m making a more conscious effort. This week I only viewed two films. One was Buffalo Boy, a subtly powerful Vietnamese film from around 2004 that is apparently the only feature-length effort by director Nguyen-Vo Nghiem-Minh. Based on Buffalo Boy, I will seek out anything he does in the future. Part of today’s morning pages was devoted to reflections on this film, and they were extensive enough that, rather then share them here in the Salon, they will become part of a proper film review in the next few days. The other film I watched, this time a repeat viewing, was The Way, Emilio Estevez’s film from a couple of years ago starring his father, Martin Sheen, as a doctor who decides to walk the Camino de Santiago pilgrimage route on the death of his son. Quite aside from the immense heart to be found in the acting and storytelling, and the beauty of the landscape along the Camino, the film reminds me how much I want to be one of the peregrinos myself one day, for reasons spiritual and historical and cultural and health-related. The history of the Camino would probably make a pretty interesting blog entry too! On the literary side, I am continuing to read Mishima’s Sword by Christopher Ross as well as the exhibition catalog for Out of Character: Decoding Chinese Calligraphy. I got stalled for a while in the latter, but am back to it and hope to write about it before very long. I’ll also be off to San Francisco in a few days, to take in some art exhibitions and films. If I’m good, I’ll report back on some of what I experience. 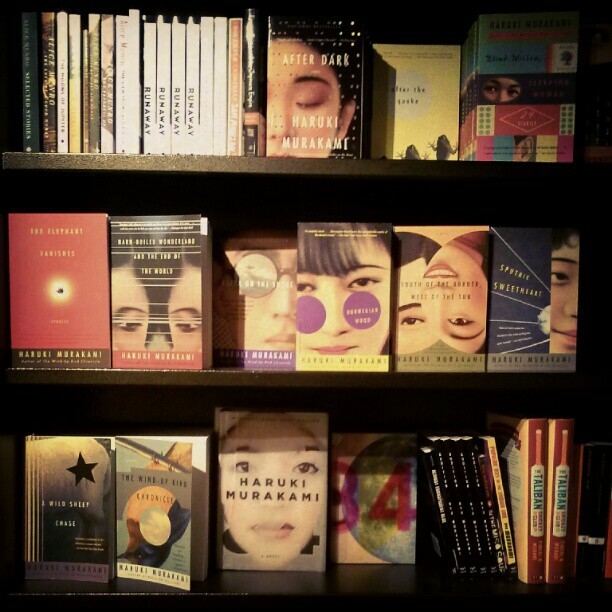 Until then, I’ll leave you with a pretty picture of books posted at the Murakami Tumblr. Kabuki is perhaps the most famous of the classical Japanese dramatic forms. Originating in the first years of the seventeenth century, kabuki quickly became a popular form of entertainment in the “floating world,” the ukiyo red-light area of Edo (now Tokyo). Like early jazz, kabuki had a less-than-wholesome reputation for a time at its inception. But that time has long since passed, and kabuki was placed on UNESCO’s Intangible Cultural Heritage List in 2005. I love kabuki for its very stylized presentation, the makeup and costumes that are such a standard motif of Japanese visual arts, and for the evocative, sometimes intense and angular, music. The JETAANC (Japan Exchange and Teaching Program Alumni Association of Northern California) Kabuki Club sponsors, among other activities, video presentations of kabuki performances (I was lucky enough to enjoy the final installment of a series they did on the now famous Treasury of Loyal Retainers, the story of the 47 Ronin). The Kabuki Club’s website has many resources and links, and its Google group is active, with current news and updates. 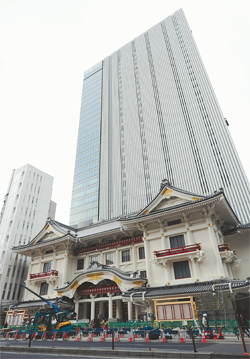 Among the issues the Kabuki Club has been focusing on recently is the brand new Kabuki-za Theater on the Ginza in Tokyo, which will open in just a couple of weeks, in the first week of April. A kabuki theater has existed on that same ground since 1889. The most recent theater, the fourth on that spot, was built in 1951, but was torn down in April 2010 to create space for the new building, number five. Helen Parker’s Kokera Otoshi blog has been following the progress on the new theater, and has some great historical information and photos as well. As a type of popular theater, kabuki has long attracted entrepreneurs and businesspeople, thereby managing to survive even in tough economic times (as opposed to the Noh theater, which is thought by many to be more refined and serious, geared toward a more cultured audience). However, Shochiku Co., one of whose major business concerns is kabuki, has seen a considerable drop off in both audience and profit since the temporary move to the Shimbashi Enbujo Theater while the new Kabuki-za was being built. Part of this was no doubt due to the March 2011 great earthquake and tsunamis in eastern Japan.